Made of tofu, nutritional yeast, hummus and chickpea noodles. 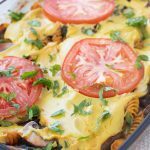 This high protein vegan pasta bake is FULL of creamy plant based power! 20 grams of protein per serving! Fall is upon us! I love the month of October. The spirit of Halloween has always been my favorite with the spooky movies, fun candy and crisp fall air. It is one of my favorite times to be outside in Michigan. This fall, my husband and I are hoping to do the tunnel of trees. Fingers crossed for peak fall colors when we go! Cue the high protein vegan pasta bake. Two words: CREAMY AND DREAMY. If I had to pick my favorite pasta it would either be shells or rotini. I love how sauce gets in all the nooks and crannies! Don’t be afraid of these ingredients if you are new to them, embrace the plant power! The nutritional yeast, cashews, tofu and hummus create a rich and creamy sauce that bakes atop the noodles all lathered up with marinara sauce and vegetables. Trust me on this one. 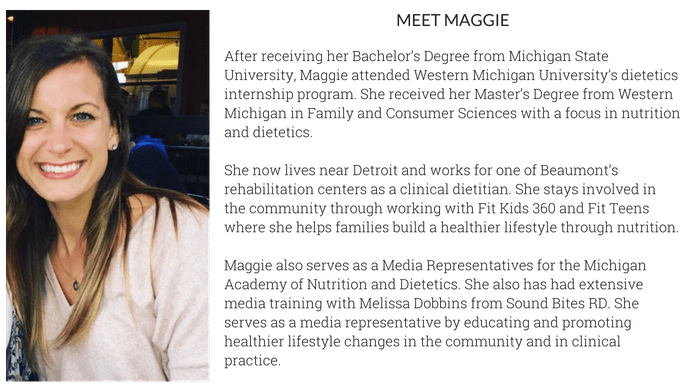 Improves blood pressure and cholesterol levels: It is no surprise that consuming a diet high in beans, legumes, heart healthy fats and low in saturated animal fats (dairy and meats) can reduce the risk of heart disease. Improves insulin sensitivity for diabetics: Better glucose tolerance and improved insulin sensitivity have been associated with increased bean and legume intake. Weight control: Vegetables and most food consumed on a vegan or vegetarian diet is naturally high in fiber. This helps to improve satiety and gastrointestinal function. I don’t want you to be rolling your eyes at this post or think that I will never make it because it has X, Y or Z. 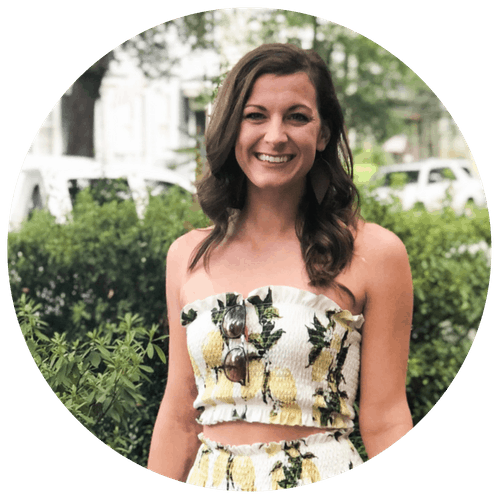 This blog is here to inspire you to create meals that may take you out of your comfort zone (I’m looking at you, mom!). I never want to sound preachy, just informative, and let you make the decisions that work best for you. 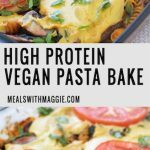 That being said, this high protein vegan pasta bake is LOADED with plant based power. Complete with 20 grams of protein per serving, you won’t miss the meat. Plus, beans are considered a good source of iron. Tofu, nuts, seeds, spinach, lentils and tomatoes are some other plant iron options, just to name a few. 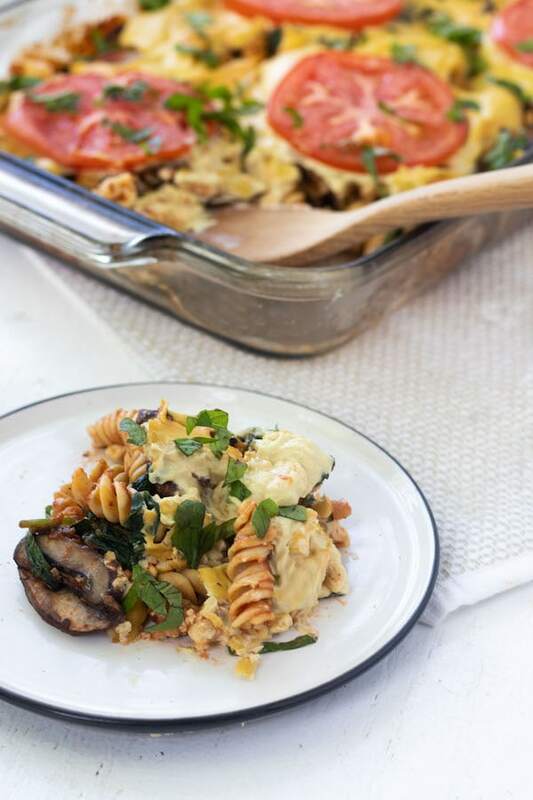 So break out from your usual casserole dish and try this high protein vegan pasta bake. Let me know what you think! Also check out this mexican chickpea bake for more vegan options! Made of tofu, nutritional yeast, hummus and chickpea noodles. 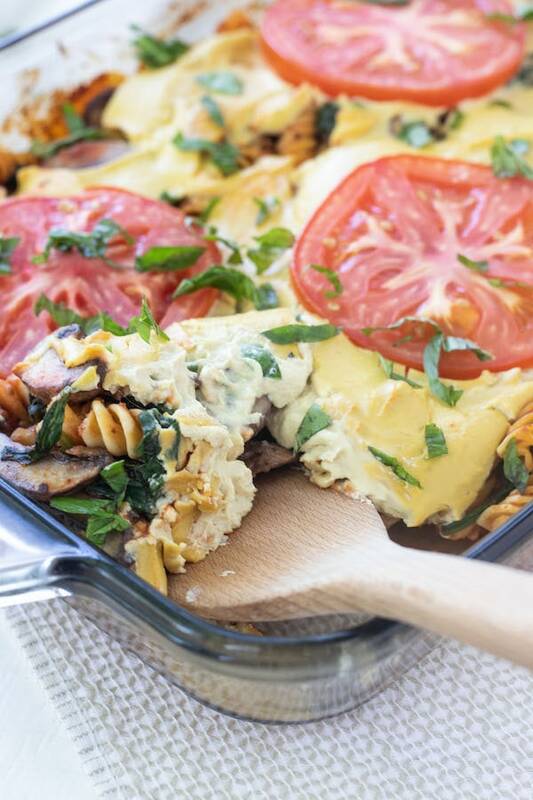 This pasta bake is FULL of creamy plant based power! 20 grams of protein a serving. Begin by boiling water for pasta and cook til al dente. Saute garlic until fragrant and add white onion over medium heat. Once translucent, add in mushrooms. After mushrooms are softened, add fresh spinach and turn off heat. While vegetables are cooking, prepare the vegan cheese sauce by combining hummus, soaked cashews, nutritional yeast, tofu, water and oil into a blender. Blend until smooth consistency. Pour vegetable mixture and drained cooked pasta into a 9 x 13 casserole dish. Pour marinara sauce and toss until noodles are coated. Spoon vegan cheese overtop the pasta/vegetable mixture in the casserole dish. Place sliced tomato on top and bake for 20-25 minutes covered with tin foil in oven. Garnish with basil as desired. To quickly soak your cashews, place cashews in small bowl with boiling water for 15 minutes. You will probably have some extra sauce left over so feel free to use it for veggie dip, chip dip or on a sandwich! Yummy! I tried a different version and this recipe is much better! It’s rich, very satisfying, and left me in no way craving cheese. I cut the recipe in half and used a high protein wheat pasta instead of the chickpea pasta and it still worked great. And, as the recipe warned, I have leftover sauce to enjoy for the next few days. Will make again ; this si vegan comfort food. Thank you so much Tracy! I am so happy to hear you enjoyed it ! !